Ask fellow campers about "Summit Lake State Park" and nearby attractions. The electric campground has two camping areas. Sites 25-51 which are located near the lake is populated with more trees. However, the sites are more uneven and some are shorter in length. Sites 1-24 and and 52-73 are more suited for big rigs and have more of a wide open area for backing. Sites 76- 120 were still classed for the season. This state park accommodates 50 amp service and each site has a water outlet. Very nice accommodations for a state park. Wonderful park to hike and enjoy nature. I expect they book quickly on weekends. 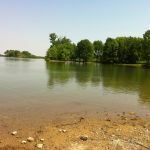 We camped at Summit Lake State Park in a Fifth Wheel. Visited mid October for a two day stop off. Camp is remote, quiet with a good boat launch into a no wake fishing lake. Wooded sites are primarily crushed rock, moderate spacing with water and 50 amp service. Water stations are shared between sites so a longer hose is recommended. Wooded lots have slight to moderate grade, several with direct lake access. There are also many level, full sun sites in grassy area. Bath house was freshly painted with even fresher spider webs that are not routinely removed. Otherwise functional. Several well maintained easy walking trails to wear out dogs and their owners. Our wooded site was frequently dropping hickory nuts on the roof for added excitement. Probably limited to this time of year. Overall a nice state park that we will return to for future leisurely stop offs. 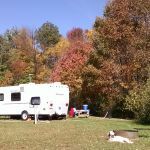 We camped at Summit Lake State Park in a Fifth Wheel. Summit lake is a beautiful lake east of Indianapolis. After Labor Day, he beach is closed, and most people appear to be there for the fishing. The campground is divided into two loops. The first loop is open, sunny, and relatively flat. The second is in the trees. Some sites are more level than others. All the sites appear to have power. The pads are gravel, or at least there's a bit of gravel sprinkled into the grass in each site. When we stepped out of our motorhome, we stepped into ankle deep wet grass. There are "shared" water spigots around the campground. People with long, long hoses were hooked up. There wasn't a single site in a mostly empty campground where our 25' hose would have reached, so we used the water in our tank. The electric hookups were closer than the water, but so far back from our site that we ended up using our extension cord to get power. The bathrooms were basic, but get the job done. Cell service was fine. We camped at Summit Lake State Park in a Motorhome. 1st time back in several years, returned due to upgrade of electric hookup to include 50amp. As with most Indiana State Parks, this park is well maintained. Service locations are acceptable, but 50 feet of water hose is needed for shared water faucet between sites. As full timers we carry 100 feet of hose at all times. Our site was easy to level on, others were uneven front to back. We camped at Summit Lake State Park in a Motorhome. We reviewed Summit Lake in 2013, and were not terribly impressed with the park facilities. Our recent visit indicated that things are looking up! The electrical problem has been remedied; campground 'A' has been completely re-wired with all new boxes and 50a service. The bathrooms are still mediocre, but they've been cleaned up, a fresh coat of paint, and other minor improvements have been made to spruce up the facilities. The showers still need better drainage and they pretty much drain into the hallway floor, but that's an engineering issue, not cleaning. DNR staff was walking through the campground on Friday and Saturday night, introducing themselves as security, and indicating they'd be on property until 4am. They were personable fellas and it was nice to know that staff was 'minding the store'. In addition, DNR vehicles regularly passed through the campground. We've noticed this trend at other state parks this year, so there might be a new directive in order from the state. The trails are easy (although described as moderate), the lake has many options for fishing from the bank, and staff shared that resurfacing the interior roads is on the horizon, as well as new gravel at the campsites, and a re-wiring of the electrical in campground 'B'. Seems like they're intent on upgrading this property. Campground A is mostly level and open, and the sites have shared, fresh water posts (two to a post). We needed 75' of hose to connect, but it's nice to have a fresh water hookup at a state park in Indiana. Campground B is more rolling, and few sites in B would accommodate more than a pop-up or tent. We are pleased with our recent visit to Summit Lake and will return. We camped at Summit Lake State Park in a Travel Trailer. Get your firewood, ice, bait, etc., at the 'Gittin' Jiggy With It' store on the highway before entering the park. The park has little/no supplies. We had one of the few pull-thru's. The park was well-groomed, the people were friendly, and the lake was clear and beautiful. Fun to ride our bikes! Our site was without shade, but there were other ones available in wooded areas. We would definitely stay there again. We camped at Summit Lake State Park in a Travel Trailer. Electricity is a problem. Entire side of campground A (where we were) lost power several times over the 48 hours we were there. A call to the office resulted in a park employee showing up to flip a switch, or something, within about 15 mins or so. Folks we camped next to said it's a regular problem there. Bathrooms and showers have standing water pretty much all the time, from the front door to the shower areas, which need painted badly to cover the rust from the iron water which is the most prominent color in the shower. Staff does their best, it seems, to keep the shower/bath house stocked and cleaned, but the facilities are in need of renovation. Hiking trails are just OK, but pleasant. Bought five green toothpicks that were being sold as firewood at the 'camp' store, which only sells ice and the so-called firewood. There are a couple bait/sundry/grocery stores a mile or so down the road from the park. The park property is nice; however, with a really pretty and clean lake. The beach is smaller than some other comparable state park facilities, and we had the place to ourselves on Friday at dusk. The sites in area A are very large, but some are full sun. Sites in area B are smaller, less level and more shaded (mostly pop-ups and tent campers in that area, it seems). There is a shared-post water hookup for the camp sites, but bring plenty of hose. We used all of 50ft. Lakefront sites were all booked when we reserved our site a week prior. Overall, the campground was filled with pleasant folks, fewer bike-racing children than we've seen at the other state parks this year, and more adult 'group' campers. It's probably not high on our list for return sites, but it's not out of the question. We camped at Summit Lake State Park in a Travel Trailer. Nice state park, well taken care off. Sites are not that level overall on the north road in section A, can flood with heavy rain. Empty for the most park during the week but packed on weekends. No sewer, water available, bring 50' of hose, 30 amp electric. We camped at Summit Lake State Park in a Motorhome. We had reservations here for two nights. Our campsite was in the wooded area close to the lake. I liked the site but we had electrical problems. Both my box and my neighbors box would trip the gfci as soon as I hooked up. I could run my generator and have no problem. Cooled trailer down and then spent the night. Park electrician came out next morning. He could find no problem with his breaker and thought the problem was on my end. I have not had this issue before or since we left park. I could defeat the gfci but we decided just to move on down the road. We camped at Summit Lake State Park in a Fifth Wheel. Nice park, with good trails. 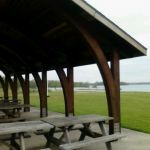 Campground has waterfront sites available. We stayed on the waterfront which are in the woods. These sites require some leveling but not bad. Word of caution: these sites can be very windy!! We were here in October and very cold wind blowing through campsites made it unbearable to be outside. Non-waterfront sites on the other hand were completely calm! Just check the weather if you can before booking. Playground available for kids. Overall a good park that we'll return to. We camped at Summit Lake State Park in a Motorhome. Nice state park, roomy and well maintained. Eight miles to New Castle and many nice places to eat. Los Amigos Mexican was excellent. Nice beach, shade or sun your choice. Gravel sites, back in and pull through. Cell phone coverage weak but doable. Mifi in and out with Verizon. Will return. 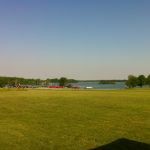 We camped at Summit Lake State Park in a Fifth Wheel. Great State Park, water requires plenty of hose to reach hydrant. Can be very busy on weekends, but plenty of sites on week nights. Sites are for the most part level, some are off quite a bit front to rear. We camped at Summit Lake State Park in a Motorhome. Back again at Summit Lake. This park is open all year. The rate posted is the off season rate. The water wasn't on yet nor were the restrooms open. Water is available from the well house only per the office. Dump station was available for use. Gravel pads level and in good condition after a very wet winter and spring. We camped at Summit Lake State Park in a Motorhome. A very nice state park. However "stimulus" money was spent planting trees that will be to close to the roads in loop "A" in years to come and will limit the access of "Big Rigs". The campground can be very busy on weekends, but during the week occupancy is sparse. There is a beach in the park but not close to the campground as is a boat rental. Shower houses are in better condition than during our last visit in the spring. We camped at Summit Lake State Park in a Motorhome. Are you affiliated with Summit Lake State Park ?